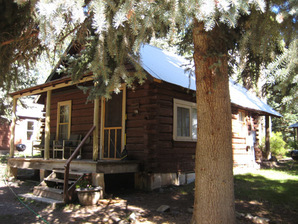 One could describe the historic Beaver Lake Lodge and Cabins as being at the far side of the town of Marble, Colorado . However, in a town the size of Marble (pop.85,) it is more precise to say that the historic Beaver Lake Lodge IS the far side of the town of Marble. Our 5 cabins were home to quarry workers a century ago. The cabins have been handsomely renovated. Each cabin is unique, but all have porches, hardwood floors, log beds, baths, kitchens and charcoal grills. Cabin rates are $135 - $165 per night, and are now open year round. Around the cabins and among the spruce and aspen trees are campfire rings, picnic tables, barbecues, and a hefty marmot that lives under the wood pile and pops up to check on our guests. The lodge was once East Marble's school house, built in the late 1800s. Over the years it has been added onto and transformed into the town's meeting hall, a bait and tackle shop, a restaurant, and since the mid 1950's, a lodge. The rooms in the lodge are newly renovated. In contrast to the more rustic cabins, the lodge rooms have a Country Inn appeal: antiques, down comforters, Matelasse coverlets, vintage-style wallpaper and poster beds. Each room is accessed from an outside porch, and equipped with a bath and a kitchenette (one has a full kitchen). Lodge room rates are $135 - $150 per night, and are open year round. Our Great Room is available to groups. This is a fabulous place to gather, cook and dine. Those who don't want to cook on vacation have been thrilled with our catering recommendations. Summer is our gilded season, when visitors swell Marble into a mountain leisure park. There is no golf, no tennis, no scuba diving - but there are fishing holes, river rafting, lake activities, horse rides and pack trips, hiking and biking trails, wildlife, jeep tours, ATV rentals, magnificent waterfalls, and relics of our rich mining culture to be discovered. In the fall we get 'leaf peepers' and hunters. In the winter we are covered in snow, and enjoy Nordic skiing, back country skiing, snow shoeing, sledding, ice skating and ice fishing. Stroll down the wooded lane from the lodge and you are at Beaver Lake , a large pond surrounded by rugged, often snow-capped mountains. Bring a fishing pole and deck chair, or paddle in our canoe, kayak, or one of our stand up paddle boards. Continue, and the wooded lane becomes a jeep trail to the remote ghost town of Crystal City. 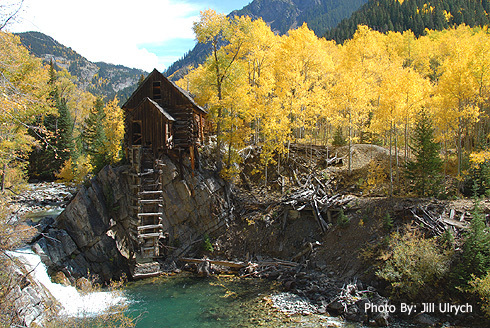 On the way, stop at the famous Crystal Mill . Walking back through town you will cross a bridge over Carbonate Creek and find yourself at Slow Groovin' Restaurant, renowned for their award winning BBQ. Across the street is the old State Bank building, now a coffee shop and information center. Around the corner is the restored Marble Community Church, with an active congregation of people from all over the Roaring Fork Valley. Marble's mining heritage is different than all the rest in Colorado's rugged mountains because in Marble they mined....marble. No messy mine tailings, no toxic dumps. However, the debris from this industry is remarkable. Everywhere you go in Marble, you find cut chunks of pure white....marble. The Yule Marble Company was once the biggest marble mine in the world, staffed by Italian and Greek carvers and American industrialists. There was a gondola up to the cutting pit, which, unfortunately, crashed twice. The second of these crashes caused the death of the President of the Yule Marble company, which led to an irrevocable decline in the fortunes of the town of Marble. This was before OSHA. We like to say that the pristine, mis-developed, rugged, star crossed town of Marble is what Aspen could have been if they'd played their cards right!